In last week's post, I talked about how I did a rub-off for the above cardigan and I definitely wanted to let everyone in on my secrets for how to do this yourself. Ok, ok, its not really a secret, but still there are many who don't even know what a rub-off is. I didn't until a few years ago either, but basically its taking an existing garment and creating a paper pattern from it. There are several methods that you could use - some may damage the pre-existing garment and there are those that won't. I used one type of method for my couch - where I utilized muslin and draped it over the existing couch in pieces to create a pattern. I was sooooooo thrilled with how everything turned out with my couch, that I simply had to give it a shot with an actual piece of clothing. I used a different method to achieve the rub off in the case of my cardigan. 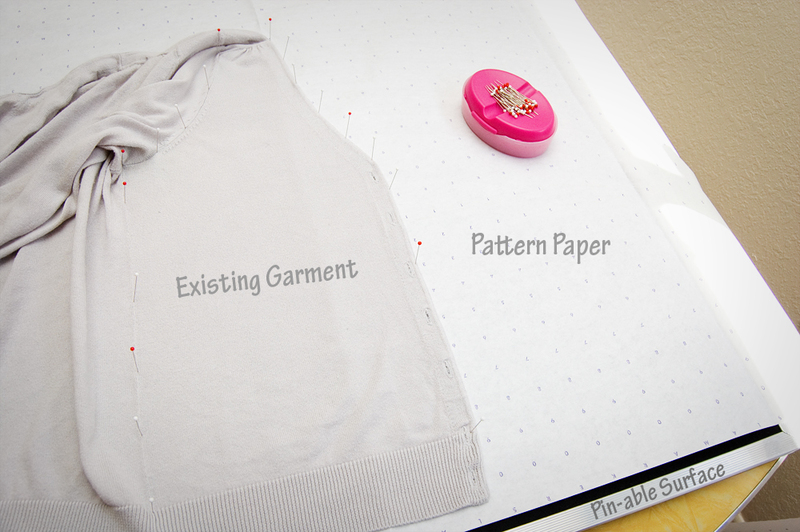 In that particular method, I put pattern paper underneath the existing garment and put both of those layers on top of an old flannel board I found at my local thrift - you can totally use anything that a pin can poke through - and stuck pins into the garment seamlines and edges. From there I took out the pins and connected the pin dots with a pencil and added seam allowances and any details - like pleating or gathering or design lines - which were in the original cardigan. It might sound intense but, really its not and in both cases - muslin draping and pin dotting through to paper - the original garment is not harmed and can still be worn. 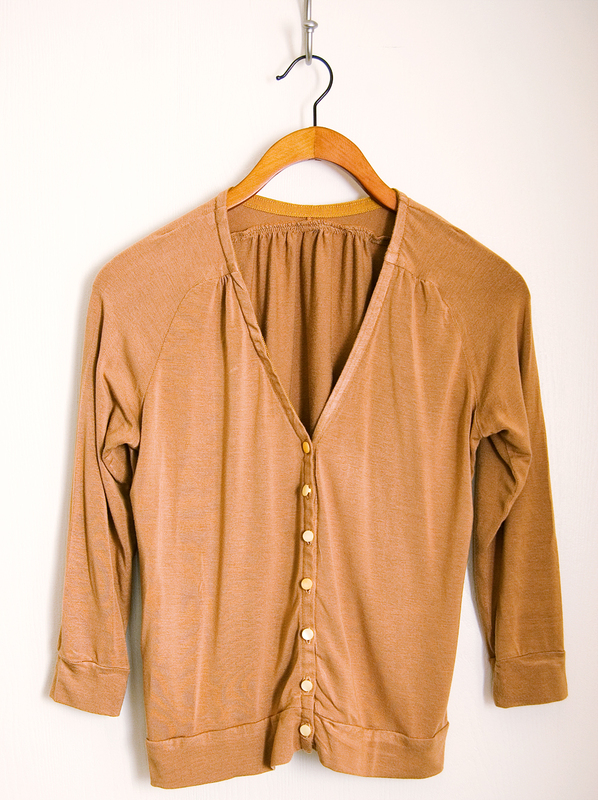 This is extremely beneficial for garments that you want to copy that are vintage. So you might be asking where in the world I learned about these methods and how to do this. I would love to tell you that I came up with all of this on my own, but no, I didn't. Instead, if you are interested in doing this yourself, you absolutely need to get a copy of this rather amazing (and extremely affordable) book. 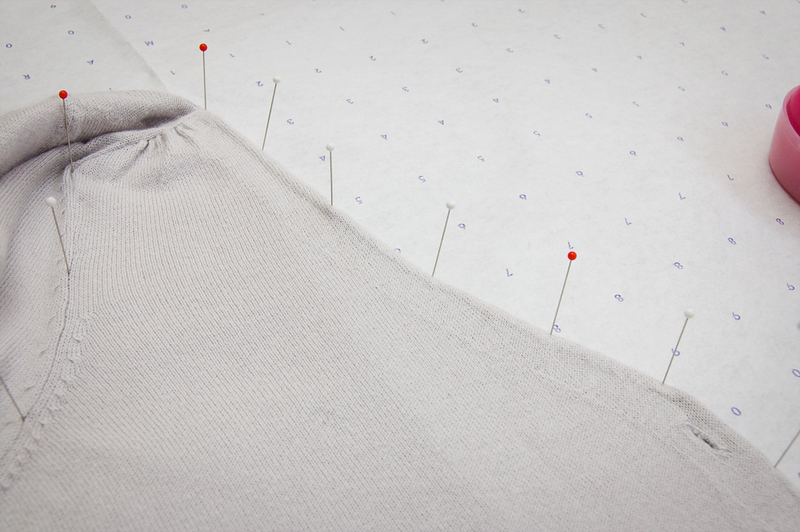 Patternmaking for a perfect fit by Steffani Lincecum. I think this book is full of informational gems and really for what it contains, I'm actually really really surprised that more hasn't been said about it by the sewing community. I actually bought the book thinking it was something completely different than it was - I feel the name of the book is a bit misleading - and when it arrived was even more happy that I had purchased it as I was pleasantly surprised by the content. Not only does it guide you through the two methods I mentioned above about how to do a rub-off, but it is chucked full of information on how to add in elements from the garment you're rubbing off and how to draft and alter the pattern to create several different looks. I think the really great part about this whole thing is that, for the most part, when you become confident in your rub-off skills, you'll find that you can forget doing a muslin - the muslin in this case would be the original garment - granted that you love the way your original garment fits. Also, if you love the shape of the original garment, but it hasn't ever fit quite right, you can rub-off a pattern and fix the fit and make up the garment in something even better than the original and voila - a perfectly fitting garment that you already know that you'll look good in and love. I just did this with my mom's old boyfriend jacket. I love that jacket, but its much too tight across the upper back and guess what? That's something I know how to fix and so I rubbed it off, altered the pattern and am now just about to cut it out in a fabulous ponte knit - something I'm terribly terribly excited about! Now, this is something that I would definitely rate as intermediate. The book can guide you through how to make a rub-off but you have to know how to construct the garment without instructions after its been rubbed off. Steffani's book guides you through doing a few different types of construction techniques for a few basic garments, but I feel that this is best learned by actually sewing up like garments through the process of constructing sewing patterns. For example, the cardigan that I rubbed off had a raglan sleeve. Not only would I have been befuddled when it came to rubbing it off had I not already seen a raglan sleeve pattern piece before, but I would have been even a bit more bewildered as to how to construct it too. You also need to be able to dissect a piece a clothing, meaning that you need to have a general idea of how it was patterned - princess seams, darts, gathers, sleeve type, etc. This also comes with experience and time. I have several garments in my closet that are RTW and that I'm excited to rub-off. What about you? Is this a technique that you would utilize? I highly recommend Ms. Lincecum's book - it's excellent! Also, this opens up a whole new world of items you can add to your wardrobe without having to necessarily test drive a sewing pattern. Try it - it's totally addicting! I've never heard of a rub-off before your post the other day. I have a dress in my wardrobe that I love the shape of...... I'm going to try and give this a go with it. And I've added the book to my Amazon wish list. Thanks for the tutorial, Sunni! I'll definitely check out her book. Thanks for this Sunni. I think it would be also very important to consider well the fabric used for the new garment. To be most successful immediately, it would seem the closer to original fabric, the better the result of the rub-off. What do you think? It's such a great technique. I love using it to multiply all of those garments that I love and wear to pieces and have them in different patterns and prints. If I didn't do this I'd have to say goodbye to my favorite garments for good. oh wow! thanks for sharing this. I totally have a favorite dress I want to try this with. It fits great and makes me feel great but the fabric is very worn now and a little see through in places because I wore it so much! this may be its savior! This is great information on a rub-off. I need to check out the book you referenced as I am not familar with it. Glad I found your blog. I've done this before but never knew what it was called! I'm about to do it with a really simple top from Topshop which I love and will be super quick to run up :) Great tutorial - thank you! Funny you should post this today because I just started a rub-off of my boyfriend's favorite shirt last night. I was awkwardly shifting around some tracing paper under the shirt and using a tracing wheel to mark my pattern paper, but I knew it wasn't completely accurate because of all the movement. Your post inspired me to do more research on this technique and I found Ali's blog post that Alessa mentions above... http://wardrobereimagined.blogspot.com/2011/10/how-to-copy-ready-to-wear.html . She used the same book by Steffani Lincecum to make her own rub off patterns, and demonstrates a part of her process. For those of you without a foam board or flannel board, you can use cardboard, too! I have plenty of cardboard after moving last month, so this is good to know. This sounds perfect for a favorite top of mine, and my Nana's vintage bowling shirt which is easily two sizes too big for me (but still passable). Thanks for sharing! 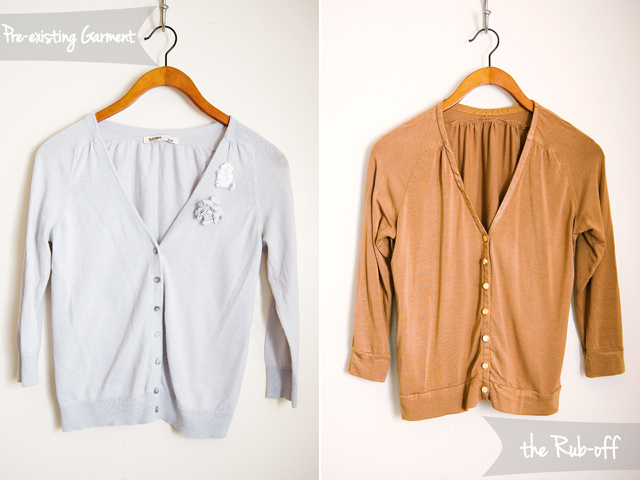 Love the cardi! I never knew what a rub off was! Thanks for explaining it. I've only done it with a basic t shirt and an open cardigan- never with darts or princess seams. I'm sure those are more difficult. :) I will totally have to check out that book too! I too had never heard of this technique, so thanks for sharing! I will definitely be putting this to good use and doing some more research, thanks everyone for the extra tips and links too. I'm intrigued as to how you work out how much extra fabric it takes to account for the gathers. But I guess the book you recommend will go into that. Hello! This is such a great post! Would you be interested in sharing this post or something similar with the Fabric Mart blog? Our customers and fans would love to meet you and learn this technique! Please email me back if you would be interested in a guest post position. Thank you! We're following you and love what you have been up to! I would be happy to Kaitlin! I'm a big Fabric Mart fan - I've bought so much fabric from you, its crazy! Yes, it does go into that. I think. Actually, I was planning to do a few follow up posts about certain techniques that are the hardest, like rubbing off a sleeve which I've heard several people remark is the one thing that fowled them up. It's truly a really really great book. I find myself reaching for it all the time now with all the rub-offs I've been doing. They are truly addicting! It is perfect for you perfect top! Truly, get the book - you won't regret it! I love how Ms. Lincecum not only shows you how to rub-off clothing, but she also shows you how to pattern new elements. It really makes for an even more exciting book because there are so many things you can do! Perfect idea! I think you'll really like the book. I love it myself! I've also heard it referred to as "slipping a pattern." I'm sure there are many other names too. Give it some time and maybe come back to it. I think even two or three years ago, I wouldn't have been at the point where I understood how to do this yet either. I could sew yes, but the idea of creating a pattern really had me bewildered. I think once you get more garments under your belt, you'll be fine! A great idea! Ms. Lincecum's book also mentions ceiling tiles - which apparently are very affordable from a home improvement store. I just had a look at Ali's blog too and its the same exact method I use. I love it and I love seeing someone else giving this book some props for how awesome it is! One of the best investments in a book I ever made. I do hope so! Its such a great method and something that really didn't occur to me that you could actually do unless you took apart the entire original garment! I know several people who have done that - unpicked an entire garment to get a pattern! I love that she shows you ways to do it without harming the garment you're rubbing off. Also, its such a creative confidence building book with all the different options she comes up with from one rub-off. Really makes you feel like you could create an entire wardrobe from a shirt and skirt that you already have in your closet! LOVE THAT! I'm going to as well. Sometimes this fit-fighting with patterns just gets to me and to be frank - I'm really tired of it! There are things that actually fit me that are RTW and if I make a pattern from those goodies in my closet and start drafting in different ideas for them, I can have perfect fit without the fight and a closet full of great clothes. Who would've thunk? Definitely do! Its really fun and rather liberating! Yay! A break from traditional sewing patterns and fit-fighting! Me too! Its something of a revelation! Yay! Yes, I think so. Coming from a sewing pattern background, I find myself thinking in terms of "suggested fabrics" and wandering through my local fabric stores touching and feeling fabrics that are similar to garments I already own and have thought about rubbing-off. It's really fun, have to admit! I've been interested in the rub off techniques every since I first heard about it. I've just been afraid to give it a try. 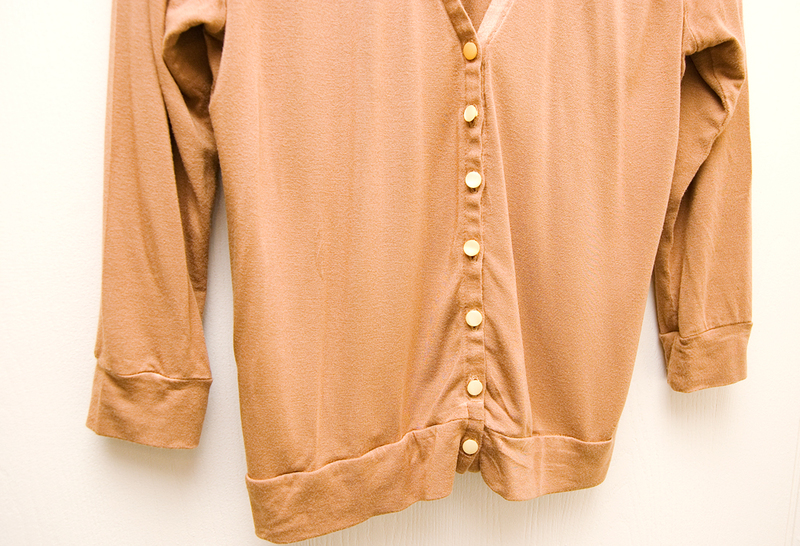 You did a marvelous job on the cardigan. I'll really have to get that book! I tried this recently with a knit tank top that I love the fit of, and it didn't work! I made the pattern, added seam allowances, and sewed up a new one - that didn't fit! It was too tight, and there was a puddle of fabric across the small of my back. Have none of these problems with the original. Any ideas where I might have gone wrong?? This is so great that you posted about the subject of rub-offs. You have no idea how many designers came to me (a tech designer) and asked to rub-off existing garments. And they called themselves a designer? Ha!